Dr. Olweus has long seen school safety as a fundamental human right.1 As early as 1981, he proposed enacting a law against bullying in schools so students could be spared the repeated humiliation implied in bullying. By the mid-1990s, these arguments led to legislation against bullying by the Swedish and Norwegian parliaments. Reductions of 50% or more in student reports of being bullied and bullying others. Peer and teacher ratings of bullying problems have yielded roughly similar results. Marked reductions in student reports of general antisocial behavior, such as vandalism, fighting, theft, and truancy. Large, significant decreases in boys' reports of being bullied and in boys' reports of social isolation. Hundreds of schools representing almost every state have used the Olweus Bullying Prevention Program, and the number is growing. 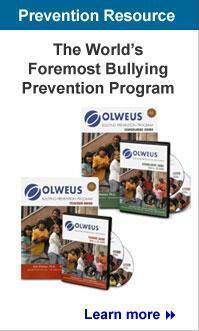 Read Olweus Bullying Prevention Program success stories. Many state governments have followed the lead of Norway and Sweden. State legislation against bullying now helps to protect a child's fundamental human right to feel safe at school. For more information about bullying prevention activities and anti-bullying or violence prevention legislation in your area, see State Laws and Information. 1. Standards are taken from John S.Kendall and Robert J.Marzano, "Content Knowledge: A Compendium of Standards and Benchmarks for K - 12 Education, 3rd ed." (Aurora,CO: Mid-continent Research for Education and Learning [MCREL,2000). 2. Dan Olweus, "Vad skapar aggressiva barn?" [What creates aggressive children? ], in Normkriseog oppdragelse [Norm crisis and child rearing], ed.A.O.Telhaug and S.E.Vestre (Oslo,Norway:Didakta,1981); Dan Olweus,"Sweden," in The Nature of School Bullying: A Cross-National Perspective, ed.P.K.Smith, Y.Morita,J.Junger-Tas, D.Olweus, R.Catalano, & P.Slee (London:Routledge,1999),7 - 27. 3. Dan Olweus,"Bully/Victim Problems among Schoolchildren:Basic Facts and Effects of a School-Based Intervention Program," in The Development and Treatment of Childhood Aggression, ed.D. Pepler and K. Rubin (Hillsdale,NJ:Erlbaum,1991),411 - 48; Dan Olweus,"A Useful Evaluation Design,and Effects of the Olweus Bullying Prevention Program,"Psychology,Crime & Law11(2005):389 - 402; Dan Olweus and Susan P.Limber,Blueprints for Violence Prevention:Bullying Prevention Program (Boulder:Program Institute of Behavioral Science, University of Colorado,1999); Jan Helge Kallestad and Dan Olweus,"Predicting Teachers' and Schools' Implementation of the Olweus Bullying Prevention Program:A Multilevel Study,"Prevention and Treatment 6 (2003):3-21. Available on the Internet:http://www.journals.apa.org/prevention/volume6/pre0060021a.html. 4. C.B.Fleming, K.P.Haggerty, R.F.Catalano,T.W.Harachi, J.J.Mazza,and D.H.Gruman,"Do Social and Behavioral Characteristics Targeted by Preventive Interventions Predict Standardized Test Scores and Grades?" Journal of School Health75 (2005):342-349. 5. Dan Olweus,"Bully/Victim Problems among Schoolchildren: Basic Facts and Effects of a School-Based Intervention Program," in The Development and Treatment of Childhood Aggression, ed.D.Pepler and K.Rubin (Hillsdale,NJ:Erlbaum,1991),411 - 48. 6. Limber, S. P. (2004b). Implementation of the Olweus Bullying Prevention Program: Lessons Learned from the Field. In D. Espelage & S. Swearer (Eds.) Bullying in American Schools: A Social-Ecological Perspective on Prevention and Intervention (pp. 351-363). Mahwah, NJ: Lawrence Erlbaum. 7. Black, S. (2003). An ongoing evaluation of the bullying prevention program in Philadelphia schools: Student survey and student observation data. Paper presented at Centers for Disease Control's Safety in Numbers Conference, Atlanta, GA.